How do I enable collision for custom mesh at runtime? I've successfully assigned an array of triangles to a custom mesh, and it's displaying just fine. What would be the best way to enable collision for this mesh during runtime? I want the player to be able to walk upon the mesh. I am using a 3d simplex noise function in C++ that I've exposed as a blueprint node to generate the terrain on the fly, seeding a random float to the Z value for randomization, using the rest of it as a 2d noise function (hope that makes sense). 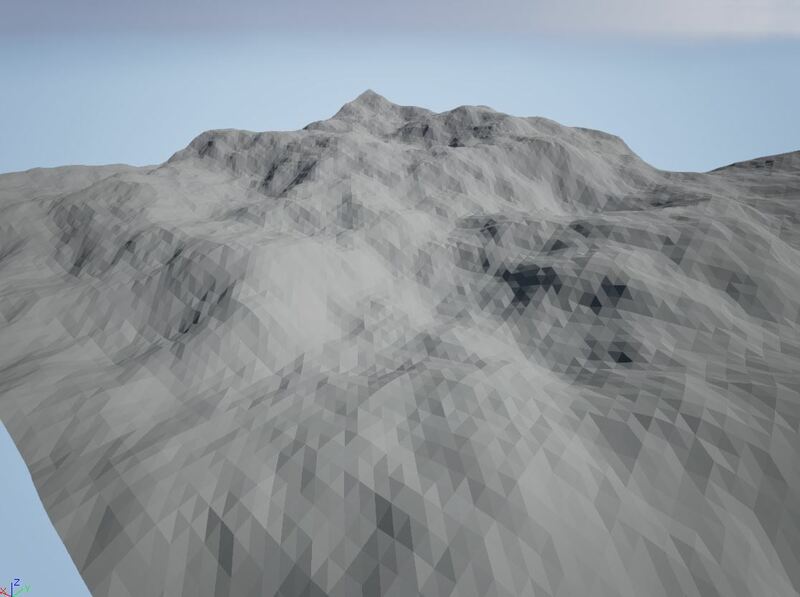 Long story short, I'm generating random terrain via custom mesh triangles, and I want to walk on it. I'm also trying to find out what other problems I might run into in terms of AI, navmesh, and level streaming using a noise function to generate a world. As far as I know, there aren't a lot of examples of this type of world generation in UE4, and I'm interested in what kind of trouble I might run into later, but I'll save those troubles for other questions, right now I really just want that collision! If there is a better way to generate terrain like this, I'd love to hear it as well. It would be really neat if there was a way to feed my noise height values to a landscape at runtime, and use that instead, but as far as I know, that is not supported for landscape. As far as I know, this is currently not available by default in the custom engine. I'm hoping for the same thing. I downloaded the preview but haven't had much time to screw around with it. It would be cool if they made a blueprint node for making physics collision primitives with vertices or something like that. I don't know exactly how the system works for assets generated at runtime though. I'm sure i could extend and expose some things to make one though if I dig around in that example. That's what I did and was running into an extreme amount of hanging. It would be best to create the mesh and collision in a separate task and then place in the world when it is finished. How to use mesh overlap event? Does AnimMontage play on a dedicated server for the purpose of collisions?